Surrounded by the reddened earth of southern Africa, a brilliant sunrise indicates another scorching day of sunshine and dust. Birds scatter in fright as the silence is broken by the approach of a roaring V16 truck. Box Hill Institute’s Class of 2018 gets underway at 7am and the arrival of a truck at the Zambian copper mine announces the start of the next assessment. Young mother and Box Hill Institute student, Thelma Mwafulilwa climbs down the 20 steps from the truck cabin – her office – to begin training her newest recruits. The truck she drives and is training her colleagues to drive is a 480 tonne Hitachi Eucalid capable of carrying 250 tonnes of copper-rich ore on the mine site in the north-western province of Zambia. Box Hill Institute Institute’s client Barrick Gold Corporation operates the Zambian copper mine producing around 120,000 tonnes of copper annually from a mine site the size of nearly 6,000 MCGs. Thelma is studying with Box Hill Institute to be a trainer and assessor for the ongoing Driver Education program for the mine’s fleet of more than 60 on site trucks with 5 more on the way. 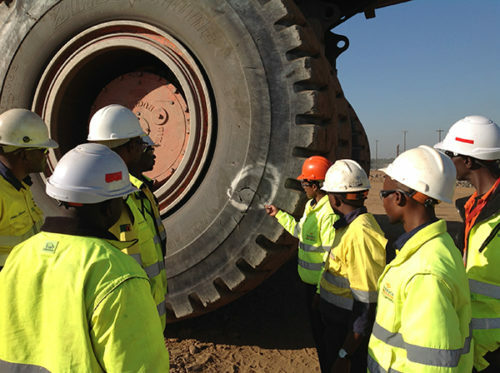 With staff imparting mining and driving knowledge and skills to fellow employees in their adverse conditions, the Enterprise Trainer and Assessor Skill Set was chosen from the Certificate IV in Training and Assessment (TAE40116) to provide standardised benchmarks across the corporation, as part of the Barrick’s Competency Based Employee Development program. Thelma has been working on the mine for five years. 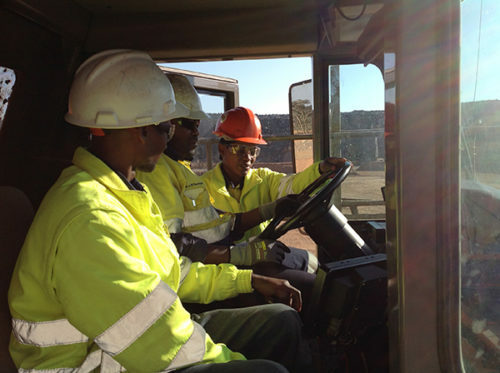 Originally employed with her Diploma in Information Management, she moved to truck driving to support a training request for more females in the mine. Thelma said that it is commonly argued that the women are the best drivers on site. One of her closest mentors, also a trainer, is another inspiring young woman, a Box Hill Institute alumna who operates trucks that drill holes for the explosives. Thelma’s immediate goals? To successfully complete her Box Hill Institute course in June and, when the new Eucalid 5000s arrive in August, to begin driving and training operators on the tenth largest truck in the world with a gross operating weight of 500 tonnes. Thelma’s daughter thinks her mum is “amazing and extraordinary” and others are quick to agree. Standing tall at 1.7m, colleagues often joke with her that she is too small to drive the seven metre high truck with its four metre wheels.